I’ve always had a lot of hobbies, and loved learning new skills. Knitting, spinning, gardening, biking, journal-making you name it. But they were always just that: hobbies. The world I grew up in told me I could have as many hobbies as I want, but at some point you get a career. Most likely in an office. Most likely in front of a computer. And because ever since seventh grade when I stood up for monarch butterflies in a science class discussion of GMOs I have been labeled as a do-gooder and environmentalist, I sort of imagined my fate in the office of a non-profit, getting paid meager wages to do tasks I cared about theoretically. Recently I have felt that because I have no idea what the world will be like in three years, I can’t really know what I’ll be doing. While I still believe this, Summer of Solutions is opening my eyes to the potential to make a job out of the things I love. One of my favorite organizations of all time is Books for America in DC, where I volunteered for awhile and now always make a point to stop by when I’m in town. It was started by a guy who collected books in his apartment to donate to schools, shelters and prisons. His collection grew so large he started an organization out of it, which now has a warehouse of books that teachers and others can choose from. All the books that can’t be donated are sold in the store in Dupont Circle at bottom dollar. The proceeds are donated to the same institutions that get the books. So it’s a non-profit that consistently makes money. The recession year of 2009? Biggest profit margin ever. Why is this so revolutionary? The non-profit sector has been at it for a while, but something’s not working. Not for our schools, our health, our natural world or our workers. Relying on grants and donations to fund “good work” only gets us so far. If we’re trying to change the system that created these problems why remove ourselves from competition with it? Innovation drives change. 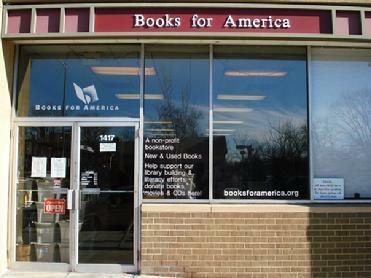 Books for America can compete as a bookstore while sustaining its charitable mission. That changes the rules of the game, instead of operating in the margins. So what am I going to innovate? I spend a lot of time thinking about waste and overconsumption in America. The amount of stuff that’s sitting out there in someone’s basement or attic or garage. Books, bicycles, lampshades, birdcages, futons. The fossil fuels poured into all this stuff. And then the number of people who wake up in the morning needing something desperately. How do we bridge that gap? How, like Books for America, do you turn that exchange into something more than charity, into something mutually beneficial? Books for America. 22nd and P if you find yourself in DC.